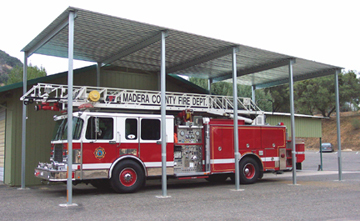 Commercial structures can be tailored to your needs. This kit was built extra tall for seasonal use of parking a bulldozer on a big rig trailer, or a hook and ladder truck. Posts lengths up to 32' are available, in many "extra heavy" gauges. Parking structures can be built to any length and width. This unit has parking for 14 vehicles. Please call us for details. 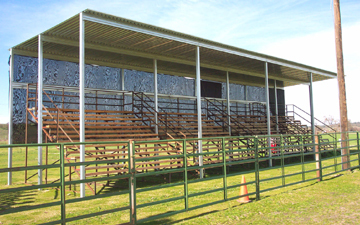 Large applications include commercial seating at this Rodeo Arena. Shade cloth was draped down over the back side for late afternoon sun protection for the crowds. 48' X 48' Hay Cover, built with 16' posts. 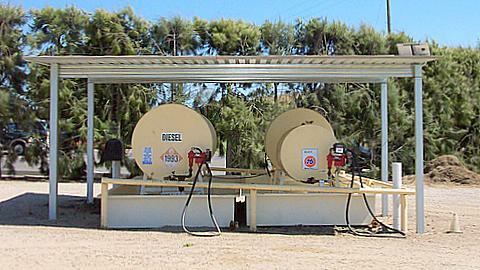 Many vineyards, and industrial facilities use these simple covers to protect fuel storage areas. Rain filling up a containment dam may lead to fuel spillage, and environmental impact concerns. Fuel hoses, and other components will last longer when protected from harmfull UV rays. 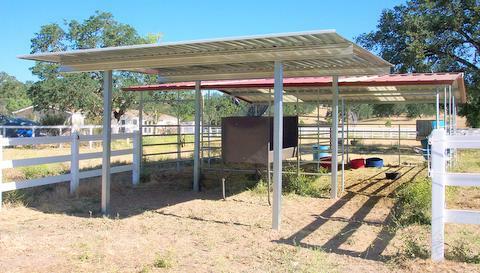 A small shelter (red trimmed unit in back) did not provide enough protection, so a new small EQ-Wine Cover was built in front and above the old roof line. Note how the posts on the new cover are brought in to provide clearance for the gates on the older unit. Posts can be brought in as much as 6' from the edges of the purlins. Sun shining in from the sides? A cheap and quick way to solve this is to just add shadecloth, directly attached to the posts. deep, and measuring 18' tall. 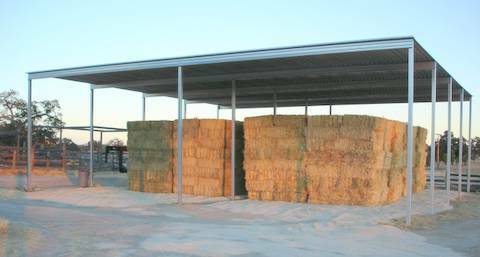 Each bay of this cover can store about 4,000 standard bales. 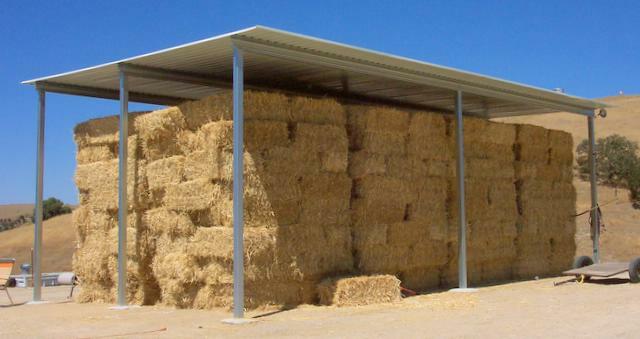 Tractors, harvesters, and other machinery can be easily stored with room to spare. 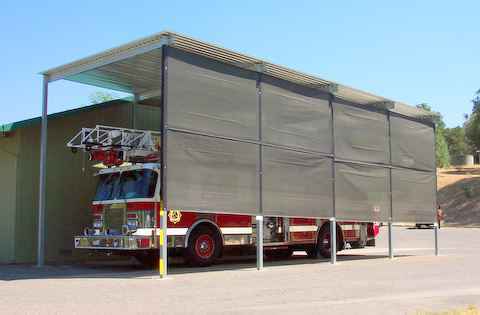 Covers can be built to your precise specs, or pick one of our standard sizes. Call us for further info on large scale covers. We can get you any sized building, in the configuration you need!